Well. Gosh. I hung out with friends on Saturday night and as we watched the election results unfold we all started to feel increasingly bleak and baffled and like getting very drunk. As I said in my last post, pre-election, everyone’s politics are personal and you’re entitled to them, but it should come as no surprise whatsoever that I’m not so much “left-leaning” as “riding through your town on a sustainably farmed unicorn brandishing a rainbow flag and leaving a fearsome trail of blood from my liberal bleeding heart”. And so, the results were not what I was hoping for and voting for. But here we are, and all that can be done is that we try to support the vulnerable and the needy and the children and so on and make the best of things, yeah? Which is what we should all be doing no matter who is in power, and ultimately what I’d hope anyone in power would be aiming for in some form. Also, said friends had adopted a cat that day and other friends brought their pet corgi along to the party so there was much comforting snuggling and patting to be had. 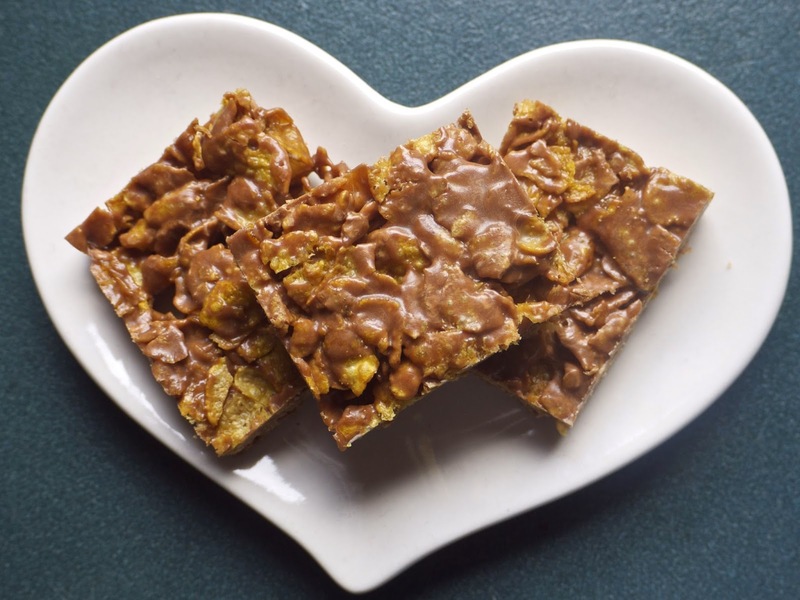 I made this Mars Bar Cornflake Slice to bring along, thinking rightly that something sticky-sweet and deliciously immature would be ideal on such an intense night. It is adapted from a recipe in my queen Nigella Lawson’s book Feast, and you’re actually supposed to spoon the mixture into little cupcake papers. I thought I had tons of them but could only find like, seven, so panicked and threw it all into a flan dish and hoped for the best. And joyfully, it’s so damn excellent in slice form. I was worried it might be a little plain – I considered putting caramelised peanuts on it, or drizzling over melted dark chocolate – but it was stupidly perfect as is. 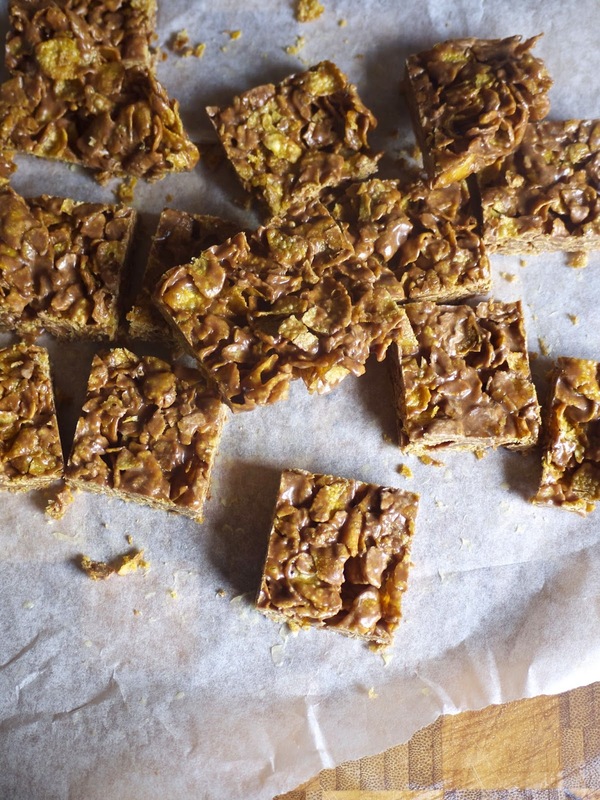 Break the mars bars into pieces and melt together slowly over a low heat with the butter. The nougat filling will take the longest to break down and probably won’t incorporate entirely, so don’t worry if the mixture isn’t completely smooth. 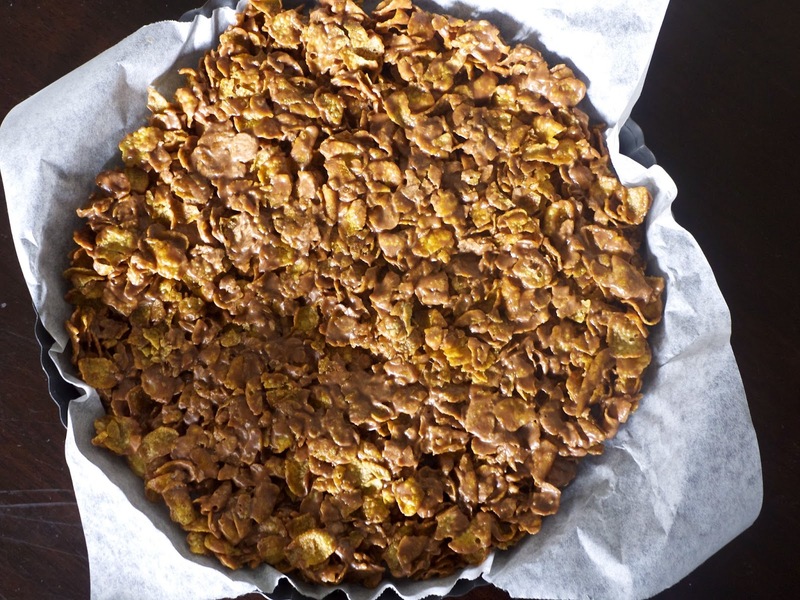 Stir in the cornflakes and spatula the lot into a baking paper lined baking dish. Use the spatula to flatten it out evenly, sprinkle over a little salt if you like, then refrigerate till solid – around half an hour. Cut into thick slices with a large knife. You can use whatever kind of baking tray you like, but I used a round metal flan dish. I think I chose it subconsciously because I have this thing where if I’m cutting up a slice from a round dish it feels like all the rounded-edged pieces are mere offcuts and I get to eat them all. Even though I’m going to eat it all anyway? Gotta get your thrills somehow, I suppose. I enjoyed being up home, trying to get the cats to bond with me, talking about knitting with nanna, making dinner for Dad and a birthday cake for Mum and generally having swell family times. Roger, pictured above, has been with the family since 2007 and my weekend at home was pretty much the first time he’s ever shown an interest in me. I am a pushover who will gladly accept this. I have been selling heaps of my cookbooks which is exciting – let me remind you that if you want to buy a copy, going directly through me is your only chance while my stocks last. If reading my words isn’t enough for you, and how could it possibly be, you can also listen to this super cool interview I did with Harry Evans for his radio show Common Ground. We discussed libraries and halloumi and the election and the writing process and social media and I got to pick two songs to play and it was just really, really fun and lovely. You can either listen on iTunes or on Harry’s site. Yay interviews! At least no matter what happens in life you know you’re never going to have a fight with a corgi over politics. title from: 90s cuties Ash and their song Girl From Mars. Underworld, Rez. Listening to this song honestly makes me feel like I’m a flower petal adrift on late summer evening breeze. Literally. Street Chant, Salad Daze. It’s so so dark and shadowy and hypnotic and good. Charli XCX, How Can I. Sad pop sad pop, whatcha gonna do when it comes for you. Buzzcocks, Ever Fallen In Love (With Someone You Shouldn’t). Oh, this song! Next time: I was given a ton of grapefruit from someone’s tree which is pretty exciting, therefore maybe it will be something grapefruitly? “Riding through your town on a sustainably farmed unicorn brandishing a rainbow flag and leaving a fearsome trail of blood from my liberal bleeding heart” = Yes, yes and yes. A girl after my own heart! Bless you and your scrumptious creations! I have a couple of very talented campaigner friends who were working for the Labour party on that election, so I am completely baffled by the stupidity of the NZ electorate.